Knee-Pro pads provide the ultimate combination of protection, comfort, durability and reliability. 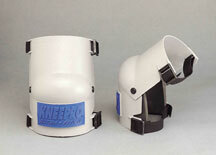 They feature tough hard plastic outer shell covers and protects entire knee, hinged for natural motion of knee. Lightweight enough for all-day use, and a 1/2" (1.27 cm) closed cell foam inner pad provides superior comfort. Sellstrom Manufacturing Company, One Sellstrom Drive, Palatine, IL 60067. Tel: 847-358-2000; Fax: 847-358-8564.